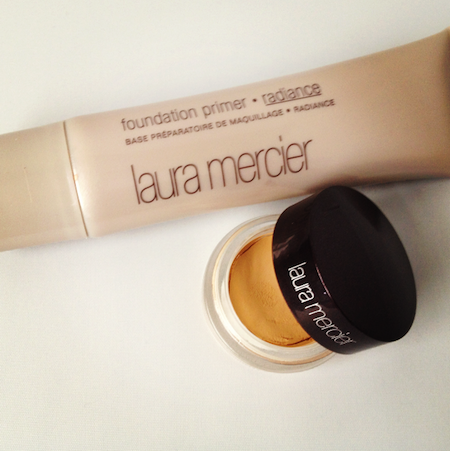 This is a review of both the “Radiance” Foundation Primer and the Eye Canvas from Laura Mercier. If you want to see the Eye Canvas in action, just flick back to yesterday’s post – it’s used in the Monthly Favourites video. I’m sorry that it looks a little orangey in the above photo – it’s not quite that orangey in real life! More a medium concealer kind of shade – you can see it in the video for the absolute true tone. I used shade EC2, but there are others to choose from! OK, let’s start with the Radiance Primer. I love the texture of this – nice and moisturising – but BOY does it give off a glow! It’s unreal! I tried it under the heaviest foundations I own and it still shone through like a beacon! So yes, it does exactly what it says on the tin. Primes (very nicely, actually – base goes on like a dream over this) and Radiance-s. I would be tempted to use this sparingly – ie, not on the T-Zone. Perhaps it’s because I have combination skin, or perhaps it’s because it’s summer and my face is a little shinier than usual, but this primer is a little too much for me as an all-over product. I have been using a mattifying primer on the T-Zone and then this one on my cheeks and temples – almost as I’d use an illuminator, but underneath my base rather than over the top of it. On to the Eye Canvas. This is great. I have been using it daily, and sometimes without even putting any shadow on top! As a shadow base, it does its job perfectly. Colours are more vibrant and intense and the Canvas conceals lid darkness and unsightly veins without being thick or waxy. It has the consistency, in the pot, of a solid concealer, but it’s surprisingly soft and easy to use – I just use my fingertips, but you’re probably meant to use a brush. For hygiene reasons. Oops. Previous Post June Monthly Beauty Favourites! Next Post The Difference Between Men and Women.